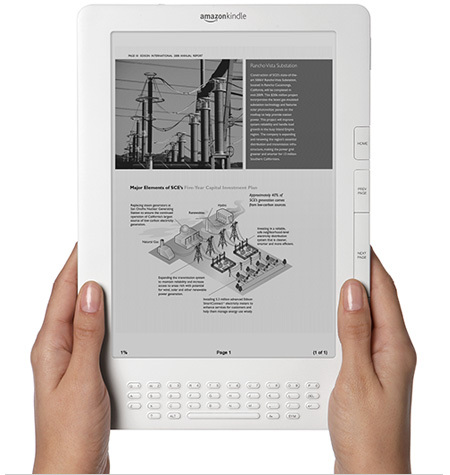 Amazon has just announced new Amazon Kindle DX which is priced at $489 and is expected to be shipped in Summer 2009. The Kindle DX is slim-built, which is just over one-third of an inch. It is approximately the thickness of most magazines. This device has storage space at 3.3GB, which could hold up to 3,500 books, periodicals, and documents. It comes with beautiful Large Display, measures 9.7″ diagonal e-ink screen that allows you to read like real paper. It is also boasted with 16 shades of gray for clear text and sharp images. With the Auto-Rotating Screen, you can choose to read in Portrait or Landscape. The display auto-rotates from portrait to landscape as you turn the device so you can view full-width maps, graphs, tables, and Web pages. Kindle DX has a built-In PDF Reader that allows you to carry and read all of your personal and professional documents on the go. 3G Wireless features is useful features that let you download books right from your Kindle DX, anytime and anywhere. There is no monthly fees, no annual contracts, and no hunting for Wi-Fi hotspots. The book will be delivered wirelessly in less than 60 seconds where no PC is required. Kindle DX has long battery life. User can read for days without need to recharge. It also has text-to-speech feature and it can read newspapers, magazines, blogs, and books out loud to you. You can choose your book from over 275,000 books at low price. For example, New York Times Best Sellers and New Releases are only $9.99. 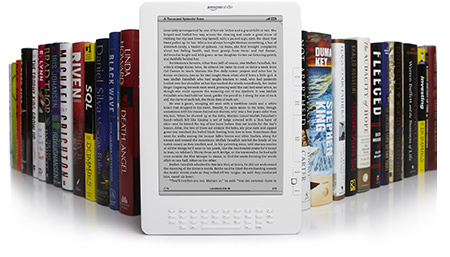 Other than book, you can also read newspapers, magazines and popular blogs wirelessly. Presently, you can pre-order Kindle DX now from AMAZON.COM. It is prioritized based on first come first served. Display: 9.7″ diagonal E-Ink® electronic paper display, 1200 x 824 pixel resolution at 150 ppi, 16-level gray scale. Size (in inches): 10.4″ x 7.2″ x 0.38″. System requirements: None, because it doesn’t require a computer. Connectivity: EVDO modem with fallback to 1xRTT; utilizes Amazon Whispernet to provide U.S wireless coverage via Sprint’s 3G high-speed data network (check wireless coverage). See Wireless Terms and Conditions. Documentation: Quick Start Guide (included in box) [PDF]; Kindle DX User’s Guide (pre-installed on device) [PDF].